Professional Scrum Master (PSM) is the cutting-edge course for Scrum Masters and any leader supporting a software development team's efficiency and effectiveness. 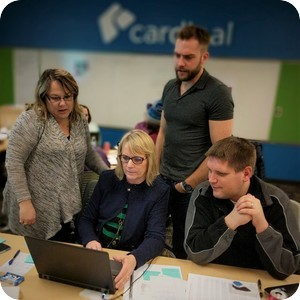 This 2-day course covers the Scrum basics, including the principles and theory underpinning the mechanics, rules, and roles of the Scrum framework. Based on these foundational insights, attendees learn how to use Scrum to optimize value, productivity, and the total cost of ownership of software products. Advanced thinking tools are introduced to support servant-leadership and behavioral shifts, working with people and teams, coaching and facilitation, and addressing the organization. Students learn through interactive instruction and team-based exercises, and are challenged to think in terms of the Scrum principles to better understand what to do when returning to the workplace. The Professional Scrum Master course is targeted to Scrum Masters, but the lessons are applicable to anyone in a role that supports a software development team’s efficiency, effectiveness, and continual improvement. If you are a leader in the successful use and/or rollout of Scrum in a project or enterprise, this course is likely to be a good fit. Upon course completion, attendees have the opportunity to take an online assessment of their skills and earn their Professional Scrum Master I (PSM I) and/or Professional Scrum Master II (PSM II) certification.